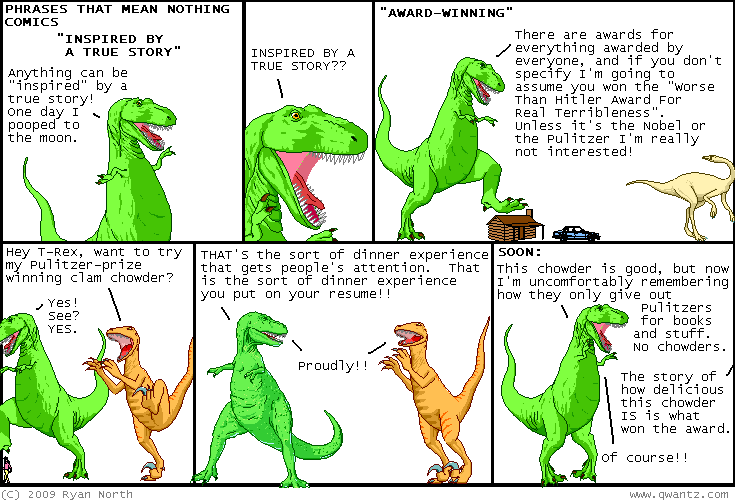 Dinosaur Comics - November 12th, 2009 - awesome fun times! November 12th, 2009: It's not quite definitely not planning any crimes ever! #seriouslyyouguys, but Rodney Bradford's Facebook status update of "Where's my pancakes" successfully acted as an alibi against a charge of robbery! Awesome, Rodney Bradford! He wasn't out robbing people because he was at home wondering where his pancakes were. But as that article goes on, it slides deep into "oh man OLD PEOPLE STEREOTYPES" territory. Joseph Pollini, who otherwise sounds awesome because he lists "hostage negotiation" as his primary area of expertise, says that teenage HACKERS could have posted that pancake-centric Facebook update to Rodney's profile while posing as Rodney at his home computer, while Rodney was actually out busy robbing at the time - which, you know, is possible? But it's not very likely, and it takes some knowledge. No problem, says Joseph! Teenagers are really good at internet, because "they use it all the time". "They [teenagers!] could develop an alibi. They watch television, the movies, there is a multitude of reasons why someone of that age would have the knowledge to do a crime like that." Is it the "the" he puts in front of "movies" that is so terrible? Is it that he believes you can get better at computers in real life by watching an actor on TV sit down in front of a monitor, a monitor so bright it projects legible text onto his face, cracking his knuckles before saying "Let's get cyber" - is that what's so terrible? Perhaps he believes that all digital photographs can be enhanced to reveal any face via the "ENHANCE" button that true hackers have access to, and that when such a hacker is faced with a screen full of the words "ACCESS DENIED" in a blinking red font while a siren goes off and laughing skulls spin in the background, they need only hit the "OVERRIDE" button. UPDATE: Michael let me know that the New York Times ain't so dang reliable, the update made by Rodney didn't say "Where's my pancakes", it said "ON THE PHONE WITH THIS FAT CHICK......WHERER MY IHOP." Guys that is so much better, this story is amazing.